A question that always arises when one is on holiday in Lanzarote is how the island with its hundreds of volcanos has been originated. During a round trip through the island, oneself can see the most different appearences of the volcanism in Lanzarote; With a little basic knowledge about the volcanic eruptions and their consequences it is possible to enjoy the excursions and round tours in the island in a different way and one understands better what is currently seen. Lanzarote is a vulcanic island; those who did in Lanzarote a mere bathing holiday will remember the numerous lava domes for a lifetime. The origination of the numerous volcanos with their partly massive eruptions has been investigated to a large extent. But the initial origination of the island and/or the whole Canarian archipielago is still unclear. What is definite is that the origination of the Canarian Islands has to do with the drifting of the Oceanic, African and Eurasian tectonic plates. In the Mid-Atlantic Ridge (a tear amidst the Atlantic Ocean of several thousand kilometres length) there is continuously magma soaking from the inner earth , so that the Atlantic tectonic plate permanently grows. In the limit range of the Oceanic, African and Eurasian tectonic plate, the Atlantic plate broke and pushed some single fractions of seabed to the top. These fractions form a base for the Canarian Islands. Lanzarote and Fuerteventura are located on such a fraction, thus they practically have a common fundament. But those fundaments are not that high that they were recognizable above the sea level as islands. The real islands were originated by some massive submarine volcanic eruptions that spit so much magma until they finally exceeded the sea level. This is the way the islands Lanzarote and Fuerteventura were originated about 20 million years ago. In western direction, the age of the Canarian Island decreases: Gran Canaria was originated approximately 15 million years ago Tenerife and La Gomera approximately 10 million years ago and the youngest islands La Palma and El Hierro are not more than 1 or 2 million years old. Of course, 20 million years ago, Lanzarote had not the shape of today but was rather a mini island in the area of the current mountain range of today Los Ajaches in the south of the island. In the course of millions of years, the Risco de Famara was added in the north; Approximately 1 million years ago, some further volcanic eruptions formed the centre of the island. The crater that is half sinked into the sea El Golfo belongs to it and its visit is part of the standard program of a visitor of Lanzarote. So much for the massive primal eruptions millions of years ago. But in the last few thousand years there were further volcanic eruptions that changed the surface of the island in a decisive way. 3000 years ago, there were some strong eruptions in the north of the island. Thereby, the glorious mountain Monte Corona and the longest lavatunnel of the world with a length of 7 km were originated. By visiting the Cueva de los Verdes, it is possible to access 2 km of this tunnel system. The most famous eruptions in Lanzarote took place in the years 1730-1736 in the area of the today's National Park Timanfaya. The approximately 100 fire mountains Montañas del Fuego slopped approximately a quarter of the total surface of the island. The land that was fertile and agriculturally used at that time was covered together with several villages by a coat of lava with a thickness of several metres. This lava flow that went in western direction makes the this part of the island to look still today like a bizarr and untouched moonscape. It will still take some hundreds of years until the island get recuperated from this eruptions. The last 2 volcanic eruptions occured in Lanzarote in the year 1824 at the east of the National Park Timanfaya. Therewith, the origination of Lanzarote is not finished yet. In the course of the centuries, milleniums of millions of years, the earth will open again, slop parts of the island and enlarge it. It is not needed to be a volcanologist to assign the volcanos and the lava fields of Lanzarote into the respective geological epoches. With a little basic knowledge about the origination of the volcanos and the consequences of the eruptions, also as a laymen one rapidly recognizes the different forms of appearance of the volcanism in Lanzarote. At first, of course one sees numerous volcanic vents that are partly already strongly eroded, but partly appear to be recently formed; None of the more than 100 lava domes in the island is right symmetrical, thus a real picture-perfect volcano. This is due to two reasons: as there is a permanent wind in Lanzarote, during the volcano eruptions, more secreted material has been accumulating at the wind-averted side as at the wind-facing side. Moreover, most of the volcanos have a sideways avulsion; most of the times, it is aimed in direction to the subterranean fault. On such a fault, there are always several volcanic vents. 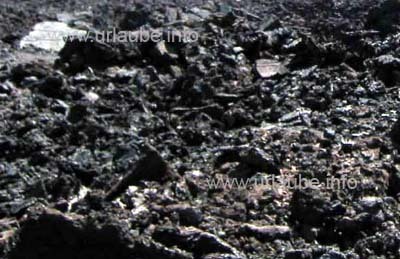 In Lanzarote, the lava that flows out of a volcano has mainly two different Toric lava, as lava is typically imagined, is origined by the fact that at the end of a volcano eruption, the lava already solidifies at the surface of a newly originated lava field while underneath, it still continues flowing. But the most impressive and frightening things in Lanzarote are the huge lava fields of Malpaís (Malpaís means "bad land"). Such moonscapes are originated if the cooled down lava converted to hard clumps of dirt is broke up and piled by replemishing lava. Those lava clumps are sharp-edged and appear to be a big unploughed acre. But specially in the area of the National Park, the flanks of the volcanos are neither covered with alluvium nor with big lava clumps. If a volcano spits properly fire, the liquid lava partly cools down in the air so much that it becomes concrete and falls down as ash rain or lapilli rain. Lapilli are little lava stones with a diametre of partly several centimetres. The whole winegrowing area La Geria is covered with such lapilli. Lapilli is used in the most hotel complexes also in the gardens ; it has the same effect as the hydroculture. What else can be originated during a volcanic eruption? If the lava already solidified on the earth's surface but continues flowing subterraneous, lava tunnels arise. The most famous lava tunnel in the island is of a length of 7 km, from which 2 km can be visited as the Cueva de los Verdes. If such a lava tunnel caves in, a coned whole arises. Such one can be visited at Jameos del Agua. And finally, there are Los Hervideros, that arise if liquid lava falls into the sea and solidifies immediately. How can be recognizd in a volcano or a lava field from which epoch of eruption it origins? Either the surface shape as also the vegetation give some hints of this. Volcanic ground is on one hand abacterial but on the other hand fertile. On the huge lava fields of the eruptions from 1730-1736, partly there is no vegetation recognizable at all but partly some first tresses. 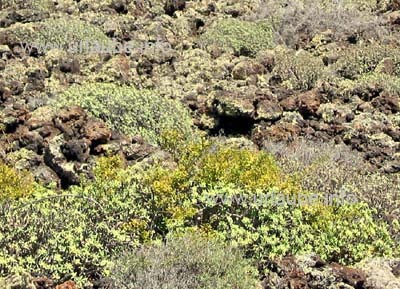 It is nearly unbelievable, but it takes hundreds of years until there is the first vegetation recognizable on lava masses. The tresses (also called lichen) are a symbiosis of mushrooms and algae and they first only grow for a few centimetres on the igneous rocks. It takes several hundred years until these lichen decompose the unshaped igneous rocks that are partly sharp-edged in fertile ground. It can easily take half a millenium until the first bushes grow on solidified lava. Thus, if one sees a big lava field with little, knee-high bushes growing, it is a sign of a greater age.